CINCINNATI--(BUSINESS WIRE)-- Filling a void in the marketplace when it comes to guy bar soapers in need of a more masculine smelling bar, the Old Spice brand from Procter & Gamble (NYS: PG) today announced it is introducing an all-new lineup of manly scented bar soaps to the brand's versatile collection of male grooming products. Arriving in stores this month, new Old Spice bar soap is available in the brand's three most popular scents - Fiji, Pure Sport and Swagger. "With new Old Spice bar soap, we wanted show the more than 40 percent of guys who are bar soap loyalists that we have their backs when it comes to manly scented shower equipment," said Joe Arcuri, Vice President, North America Beauty Care at Procter & Gamble. "We know many guys are living with an unspoken shame - that they simply use whatever bar soap is already in the shower based on what the woman in their life purchased and is often using. I guess we're also in the business of helping guys reclaim their territory in the shower." To complement the launch of its new lineup of bar soaps, Old Spice will roll out a new broadcast television advertising campaign that pays tribute to the popular jingle soap commercials of the 1980s and 1990s. Developed by Wieden+Kennedy (Portland, Ore.), the campaign demonstrates how guys can wash their body the manly way, with manly scented bar soap to the tune of an extremely masculine, yet incredibly informative jingle about their life story. The campaign will launch with two television ads, "Shower" (:30/:15) and "Watermelon" (:15) on April 9, with a third spot to debut this summer. The new Old Spice bar soap launch also will be supported by a cinema and dedicated online campaign with rich media banners bringing the marketing creative's tagline - "The Bar Soap You've Been Smelling For" - to life. As the No.1 selling anti-perspirant/deodorant stick and body wash brand with guys, Old Spice is offering bar soap users the opportunity to bring their favorite Old Spice scents into the shower and providing another tool for their daily grooming regimen. 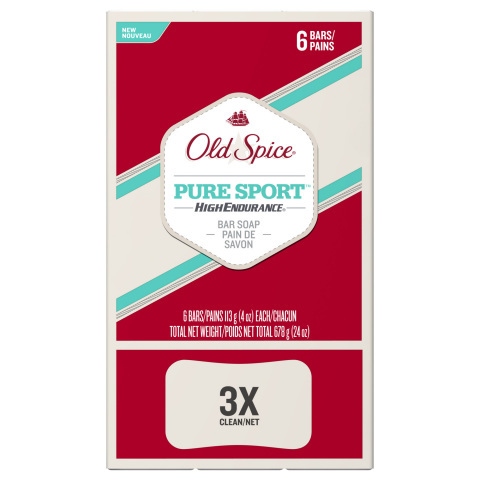 All three scents of new Old Spice bar soap are available in 6-packs (SRP: $3.99) and 2-packs (SRP: $1.79), and can be found in retailer bar soap aisles. Fiji Bar Soap - Smells like palm trees, sunshine and freedom. Smell like the kind of man who lives in the kind of place that you'd like to smell like. Pure Sport Bar Soap - Clean, fresh scent for the active lifestyle. Leaves skin feeling clean, with a clean refreshing lather. Swagger Bar Soap - Bathe yourself in power. We're not saying this bar of soap will make guys a confident millionaire jetfighter, but we are insinuating it. For more information on Old Spice bar soap, visit OldSpice.com. Old Spice can also be found on Twitter (@OldSpice), Facebook (Facebook.com/OldSpice), YouTube (YouTube.com/OldSpice) and Instagram (oldspice). Procter & Gamble's Old Spice is the quintessential men's grooming brand. With more than 70 years as an American icon, Old Spice is the authority on the male grooming experience and has leveraged this heritage to become the No.1 selling anti-perspirant/deodorant stick and body wash brand with guys of all ages. Old Spice brings authenticity, performance and confidence to male grooming and offers a wide product portfolio for today's man, including anti-perspirants, deodorants, bar soap, body washes, body sprays, after shaves and colognes. The article Old Spice Introduces New Bar Soap Lineup (Rope Not Included), Showering Guys with the Bar Soap They've Been Smelling For originally appeared on Fool.com.